The iconic Ella Train in Sri Lanka is known for being one of the most scenic train rides in the world, and can’t be missed while traveling in Sri Lanka. However, the experience is far from the leisurely, serene journey that you might expect from photos on Instagram. Here’s the truth about the Ella Train ride, and tips to help you make the most of your journey. Sri Lanka is home to one of the most scenic train rides in the world: the Ella Train. The journey takes passengers across historic stone bridges, through mountain tunnels, and along cliffs with views of sprawling green hills and lush jungles. Aside from being a cheap and relatively efficient mode of transport between Kandy and Ella, it’s also one of the top tourist destinations in Sri Lanka and makes it into nearly every travel guide written about the country. You’ve probably seen the epic photos of the Ella Train journey — passengers seating in open doorways, heads bobbing outside windows, hair blowing in the wind against a backdrop of lush tropical landscapes. And while it certainly is scenic, it’s also important to set your expectations straight. The truth is that the Ella Train is a kind of beautiful misery, if you don’t know what you’re getting yourself into. The experience can be a far cry from the relaxing, magical wilderness experience shown in photos. But as long as you know what to expect, then you’ll be much more likely to love the ride. 1) The Ella Train is packed with passengers. And I mean packed. Like sardines. Expect to make physical contact with lots of sweaty strangers and don’t expect to have freedom to easily roam about the train. You may not even have a view out the window depending on where exactly you get shoved into position while boarding. And while it’s highly unlikely you’ll get an actually seat on the train, it’s also unlikely that you’ll even have a spot on the floor to sit. Tip: Avoid traveling on weekends and holidays when the trains are even more packed with locals and travelers alike. 2) The chances of you snagging a seat in the door are slim. Considering the train carries hundreds of people between Kandy to Ella each trip, and there are a limited number of doors on the train, statistics suggest that you will not be the person to snag that coveted seat in the open train door. Instead, dozens of people will push and shove and curse their way onto the train, and only about two will get to claim each door. There’s a good chance it won’t be you, no matter how early you get to the train station, no matter how quickly you try to rush onto the train. Tip: Push your way onto that train without fear. Get as close to the doorway as possible and prepare to make friends. Ask people in the doorway if they plan to off-board the train at a stop mid-way, and if so, arrange to take their seat when they leave. And for heaven’s sake, if you do manage to get a seat in the doorway, be a good traveler and offer other passengers nearby an opportunity to sit in the doorway for a while. They’ll be super happy for it and you’ll be happier as a result. 3) You’ll need to make friends. If you want that amazing experience (and photo) hanging out of the Ella Train, you’re going to need to befriend the people around you. Assuming you didn’t snag the seat in the open door, your best bet is to be friendly to whomever is sitting there (probably other tourists and backpackers), and eventually ask if you could switch spots with them for a photo. Most likely they’ll be more than happy to share, especially if you assure them that you’ll give the seat back to them right afterward. But getting a spot in the open door is only half the battle to getting a photo. You’ll either need a friend to scoot past seated passengers to stick her head out an open window, or ask a stranger seated by the window to take a photo for you. Just be super friendly and do your best to not elbow anyone in the face, and hopefully the passenger will tolerate (or even be amused by) your commitment to that iconic photo. Tip: Snap your photo from a window in about the middle of the train car, with the subject sitting in the train door. Have your camera in fast shutter mode to avoid too much blur. And be patient to wait until you come around an arch with great scenery. You’ll regret it later if you rush to get the shot and it’s blurry or doesn’t have beautiful scenery! One of the many friends we made on our journey, all crammed in the doorway compartment. We took turns sitting in the doorway, and helped each other snap those epic Ella Train photos! 4) The views will be as incredible as everyone says. Seriously. You’ll spend hours careening over narrow bridges, along sharp cliff-sides, and looking out onto sprawling green mountains and lush valleys. It will be completely breathtaking, and no camera will every be able to properly capture those views. Tip: From Kandy to Nuwara Eliya, the best views are on the right side of the train, and from Nuwara Eliya to Ella, you’ll want to switch to the left side of the train if possible (if you’re traveling in the opposite direction, the sides of the train will switch, of course). 5) You don’t need to (and probably won’t be able to) book a train ticket in advance. Train tickets go on sale about 30 days in advance and agents almost always scoop them up before any passengers can get to them. Chances are, you won’t be deciding on your train trip until a week or less in advance (since Sri Lanka travel requires a bit of flexibility), in which case you will have trouble getting a ticket. Sometimes tour companies and travel agents will be able to get you a ticket, but they might even have trouble if you’re booking last-minute. But the good news is that it’s simple to buy a ticket at the station on the day of travel. Tip: If you’re leaving from Kandy, you’ll want to take a taxi about 10 minutes outside of town to the Perideniya Station (NOT the central Kandy station), where fewer people get on the train and you’ll be more likely to find a spot. If you’re leaving from Nuwara Eliya, head to the train station about an hour in advance. 5) You don’t want a 1st class ticket. The seats in 1st class might be a bit more comfortable, the cars might be a bit less chaotic, and the panoramic window views might be pretty cool, but if you want the true, feet-dangling-out-the-train-door, hair-whipping-in-your-face, people-watching-like-no-other experience, you’ll want to get a 2nd or 3rd class ticket. In 1st class you won’t be able to access an open train door, and the chances of you getting one of the few seats actually in front of the panoramic window are highly unlikely. Plus, there may be air conditioning in 1st class, but it probably won’t be necessary (open train doors do the trick, too) and the windows won’t open. Instead, 2nd and 3rd class tickets will allow you to access open train doors in which you can sit to soak in the amazing views and snap some incredible photos. Tip: Get a morning ticket on the Kandy-Ella (or Ella-Kandy) train in 2nd class for 240 rupees ($1.40) for the best views and overall experience. As an alternate option, 3rd class tickets cost 130 rupees ($.75) but will be a bit more crowded and chaotic, with people transporting produce and chickens. Both offer fantastic people-watching experiences. 7) The train will be late. Almost certainly, the train will run about an hour late. This might seem infuriating (why don’t they just reschedule all the trains for an hour later?) but hey, welcome to international travel. The problem is you can’t actually rely on the train being late, on the off-chance it’s on time. So, just prepare to be at the train station at least 30 minutes (an hour is safer) in advance of its scheduled departure time to purchase your ticket, and ask the person at the ticket counter what time the train is expected to arrive. If it’s running an hour late, feel free to leave and wander a bit, but come back with plenty of time just in case. Tip: Bring a book or download some music or podcasts to pass the time, pack some snacks and water, and prepare to wait. If you know what to expect, this is much less frustrating. 6) The time flies by pretty quickly. At first, the thought of spending several hours on a packed train with likely no where to sit sounded like self-inflicted torture. But really, the time flew by. The scenery was incredible, and once I got started talking with the other travelers packed into the open-door compartments, I really had an amazing time. Tip: If you really don’t want to spend the full 6+ hours on the train from Kandy to Ella, you can always break the trip up into two days, hopping off at Nuwara Eliya for the night (visit some tea plantations and waterfalls here!) and hopping back on the next morning to finish the trip to Ella. Or, if you have a driver, have him drop you off mid-way at Nuwara Eliya, and then just take the train from there to Ella or Kandy. Note that if you do the entire journey in one day, you’ll have a better chance of getting that open-door seat. You’ll be able to spend the first leg of the trip chatting with the passengers seated in the open doors, and figuring out who is getting off the train mid-way; you can then arrange to take their places when they get off. Stop in Newark Eliya to break up the train ride, and tour some of the famous tea plantations or waterfalls in the area. I read tons of articles warning travelers to take plenty of water and snacks for their journey on the Ella train, because there wouldn’t be any available on board. However, there actually where tons of people that hopped on the train at stops and sold lentil samosas and other snacks to passengers for pennies a piece — and they were delicious! Most likely you won’t want to drink much water anyway, because if nature calls, you’re sort of out of luck. Bathrooms do exist on the Ella train, but you’ll want to avoid them if at all possible. Tip: Throw a protein bar in your bag or bring some small change for on-board snacks. And be sure to try one of the samosas sold on-board! 8) Don’t even think about using the bathrooms. Technically there are bathrooms at the train stations and on the trains. At the train stations, there are separate bathrooms for locals and for tourists, with the tourist bathrooms supposedly being a bit more…comfortable. And don’t even think about using a bathroom on the train. Again, they technically exist, but trying to push through the passengers to get to one will be only slightly less miserable than actually doing your business in one. Tip: Use the bathroom at a cafe or hotel in advance, but toss some toilet paper into your bag just in case. I’d even suggest not drinking much water because, personally, I’d want to avoid those bathrooms at all costs. 9) You’ll want to pack light. There really isn’t anywhere to store your luggage, especially in 2nd and 3rd class, except in a few cubbies located near the doors. If you’re standing by the doors, you can throw your backpack in there and keep an eye on it, but I wouldn’t recommend dropping your luggage then wandering off to a seat. Things can get stolen, so always have your belongings close by and in view. Because I had a driver, I was able to hand off my large luggage to him and then just take my personal backpack with me on the train. This was much more comfortable, and I can’t imagine trying to make the entire trip wearing a giant backpack if the cubbies were full. So just be mindful of how much you’re bringing on your trip if you want to take the Ella train. Tip: Bringing a large rolling suitcase onto the Ella train looked like an absolute nightmare. 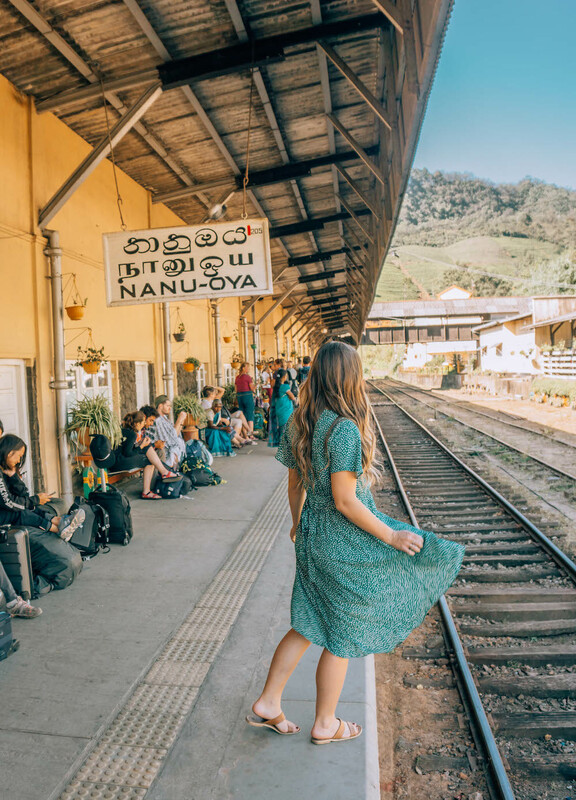 If you plan to take a trip on the Ella train while in Sri Lanka, either hand your luggage off to a private driver who will meet you at your destination, or put all your belongings in to a travel backpack. 9) It’s 100% worth it. Despite what Instagram might portray, the Ella train is so much more than a photo-op. It’s chaotic and confusing and frustrating at times, and it’s likely nothing like what you expect. But it’s so much better. The chaos off the train and the flexibility required for your journey make it truly an adventure — one with funny stories and little mishaps that you’ll tell friends and family about for years to come. Plus, you’ll be fully immersed in the most beautiful natural landscapes and the most interesting collection of human beings possible — from local commuters to international travelers who are just as giddy/stressed/confused as you are about the Ella Train. The Ella Train is truly unforgettable, and you’ll be glad you had the experience. There’s no shortage of amazing accommodations in this region of Sri Lanka, from luxury colonial manors to heritage homes to quaint homestays with friendly hosts. The Ella train really was a highlight of my trip to Sri Lanka, and I’m so glad I experienced it. I’d do it again in a heartbeat and 100% recommend it to anyone traveling to Sri Lanka! But be sure to set your expectations straight. The more time you spend being grumpy about the lack of comfort or the fact that you didn’t snag that coveted seat in the doorway, the less time you’ll have to befriend the other travelers on board, soak in the incredible views, and honestly enjoy some of the chaos around you. It’s a wonderful experience and you can get that amazing photo, but just be sure to set your expectations right and use these tips to get the most out of your Ella train journey. *Note: It is possible that you’ll luck out and have a perfectly easy, stress-free, relaxed experience on the Ella Train. I know some travelers have been this fortunate! However, my experience was not that, so I want to share the potential chaotic realities to help give you a perspective that you might not get from Instagram. Always best to be prepared for the worst while hoping for the best! Have any questions about the Ella Train in Sri Lanka? Leave them in the comments below!